Bonjour mes belles! It's finally sunny in New York and I'm taking full advantage. I'm back after a brief hiatus and on this Manic Monday, I'm focusing on Makeup, Hair & Nails -- a little bit of everything for every beauty lover out there. 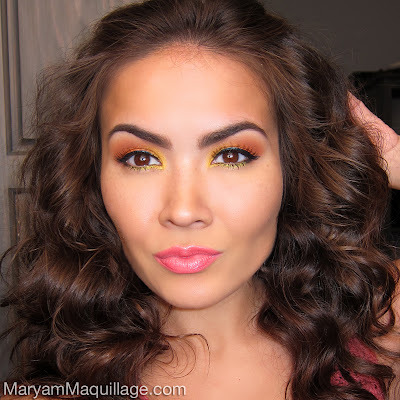 Today's look is all about the warm tones featuring bright yellow, coral, green, marigold and orange. 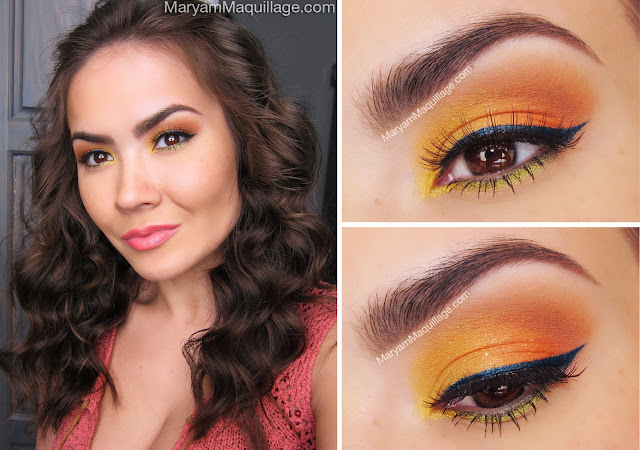 Although there are a lot of colors, don't be intimidated, this look is quite easy and is totally ready-to-wear! Too Faced Bronzed & Poreless Bronzer -- all over my face, focusing on the high points to give the illusion of a fresh tan. This warm-tone bronzer is absolutely matte and is infused with skin-smoothing properties to minimize fine lines and pores. Bronzed & Poreless is great for contouring and evening out your new tan and is also a fantastic choice for anyone with oily skin. I am in love with this all-in-one genius bronzer and highly recommend it -- it's a summertime must-have! 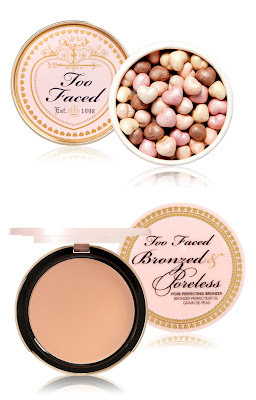 Too Faced Sweetheart Beads Radiant Glow Face Powder -- used all over the face to brighten the complexion and give the skin a radiant glow. Another must-have, this finishing powder is both beautifully made and beautiful on the skin. To apply, simply twirl a fluffy kabuki brush over the heart-beads and dust the brush over your cheekbones, nose bridge, collarbone and anywhere you want to glow. House of Lashes in Au Naturale -- Hand-made from 100% human hair, these lashes are perfect for any occasion. I love the clear, flexible band allowing for a more precise and even application. Au Naturale is a great pair of everyday lashes to complement and tone down a bright eye makeup look, plus it's a perfect choice for daytime wear. Prime the lids and allow for the primer to set. 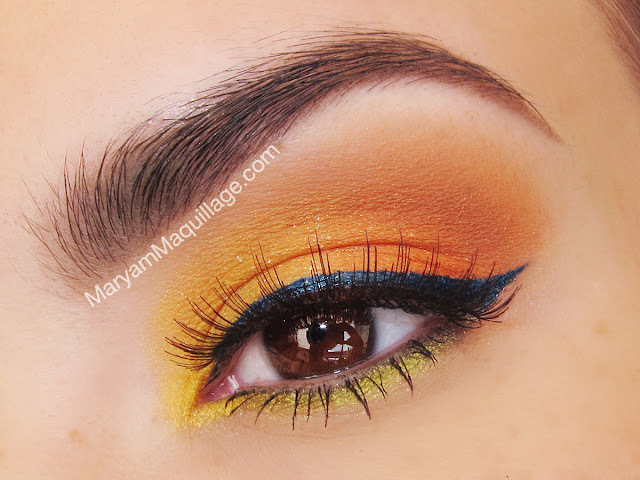 Using a flat brush, apply Lemon Drop all over the lid, focusing on the inner half. Clean off the brush and apply Mandarine on top, from the center to the outer corner, focusing the product on the outer half of the lid. Blend out the edge using Creme Brulee on a fluffy brush. Intensify the outer crease using Cocoa Bear. 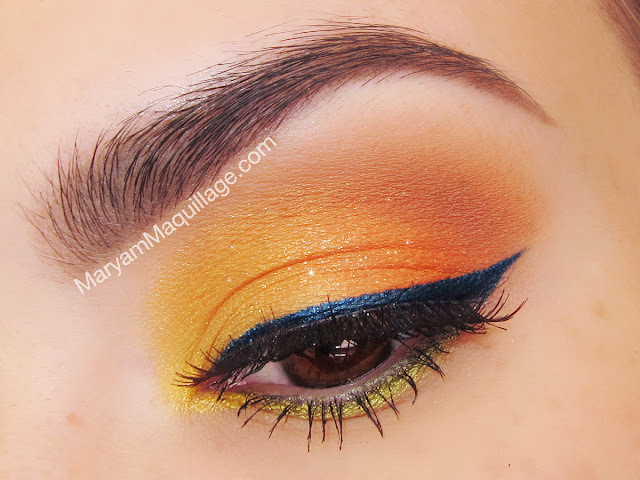 Line the lower lash line with a waterproof liner (Vert) and seal with a bright lime shadow (Pixie Dust). Line the top lash line using Fame on an angled liner brush and add a bit of Treasure to the inner corner. Apply mascara to the bottom lashes and complete the look with a pair of flirty, natural false lashes. Complete the makeup with a bright coral pout. My favorite coral lipstick of the moment is Too Faced La Creme lipstick in Juicy Melons -- I love the creamy texture, the vibrant finish, the silky-smooth formula and the pink coral shade is simply TDF... to die for!! 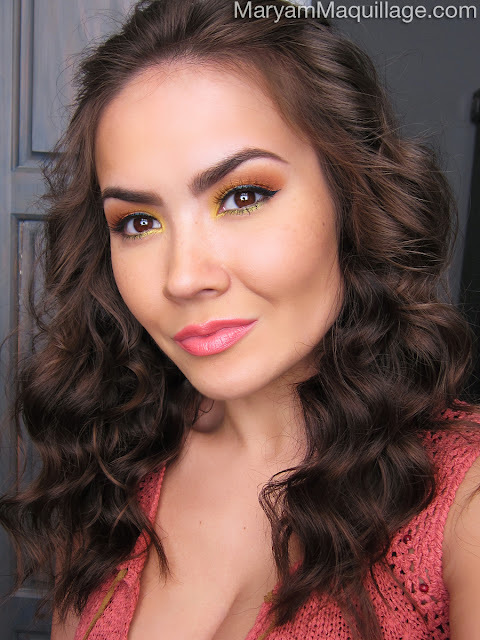 Too Faced La Creme lipstick in Juicy Melons -- great for all skin tones and looks awesome against a fresh tan! Incoco Real Nail Polish Appliqués in Garden Party (also on my accent nails) -- beautiful blooming marigold, so perfect for the season! Ginger & Liz Colour Collection Polishes -- used for the accent nails and hand-painted by Valley NYC at a recent Giner & Liz / FCUK Spring Nail Art Event -- reviews to come! NuMe Reverse 13mm-25mm Classic Curling Wand -- to curl the locks away from the face. The Reverse Wand is narrower at the base and wider at the tip resulting in tighter curls at the roots and softer, more separated curls at the ends. 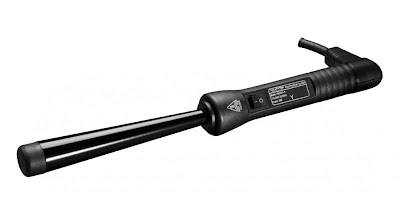 This wand gives lots of lift and body at the roots, so it's perfect for cuts with long layers or no layers. Styling Tip: Separate the hair down the center, and curl 1 inch sections at a time, placing the wand behind the hair to curl the strands away from the face. *Also Good for -- Curling Wands: Titan 3, Curl Jam, 3 Sum and 4PLAY, as well as classic curling wands and magic curling wands. Flat irons: silhouette, couture, vintage, fashionista and in vogue. Last but not least, get 60% OFF on Classic hair dryer or Signature hair dryer. This coupon code expires at the end of July, so hurry up and get your summer hair on! Don't forget to enter the code at checkout. This is an amazing look and its looks amazing on you. Your so beautiful. OMG! Everything about this look is AMAZING!!!! The hair!! WOW! This is so beautiful Maryam. I'm totally inspired now and we have sunshine here today too! Love this look so much! One of my favorite from you, that eye liner is gorgeous! Love those nail polish appliqués. It would be fantastic to be used for a fancy dress party too. You can accentuate the look you are going to sport with this kind of nail polish. oh dear sweetie I envy.. you're ready for summer and you're really such a bornzed beauty!!!! i love your nails so so cute!!!!! I was about to say, "Wow, that's some serious nail arts!" then I realized it was nail strips ahaha but good job, I can never apply them the proper way! I love your hair like this you look beautiful so gorgeous! The wand is amazing!!!! My hair cannot hold a curl, it falls out in about an hour. With this wand, the curl stayed in almost too long! Three days later, I had to flat iron my hair lightly to take the curl out, crazy!! LOVE this, it is so summer-y! You look like you need to be on a fabulous beach somewhere! That hair!! LOVE everything about this, you're gorgeous girl work it! Great color palette. Your looks are very unique and very inspirational to other people. Loving the bronzed look!! You look like a goddess, every single time!